1st) DEVELOPMENT PRIZE: MIRADASDOC will award €3,500 to a project for its pre-production. A contract will be signed in which the conditions of the prize are established: deadline of one year, delivery of supporting documents, invoices, etc. The award-winning Spanish company SUBBABEL specialises in audio-visual translation, subtitling, voice over, audio description and sign language, and together with MIRADASDOC awards the following prize: Free Translation and Subtitling (English or Spanish) of a documentary with maximum duration of 80 minutes. 35% reduction in the rate for subtitling the same documentary in another language (Spanish, French, Italian, Portuguese or German). The standard rate is 9 euros per minute. The submission of the script, transcript or dialogue list is required. 3rd) TREE LINE DISTRIBUTION PRIZE FOR ADVICE IN DISTRIBUTION AND FESTIVALS. The first: In the development phase. The second: Once the documentary has been completed. The objective: Provide a guide to which are the most appropriate festivals for the content and style of documentary, and the best commercial distribution strategy to follow (choice of distributor or sales agent, television, internet, cinema, etc. …). TREELINE DISTRIBUTION is a Spanish distribution company created by Luisa Romeo and Elena Mera, two professionals with extensive experience in national and international production and distribution. Romeo has worked in companies such as Filmanova, Explora Films and Transglobe Films, among others, and Mera in Antena 3 TV, New Atlantis and Plural Entertainment. The prize is the use of Elamedia’s facilities (editing room, colour correction and DCP copy) for the image post-production of the next documentary project of the winner (director). This award consists of an all expenses grant to an AFRICAN PROJECT. This project will be selected by a comitte of experts to attend the pitch worksho and Pitch Sessions. One pitcher will be able to attend MiradasDoc Market on June 18,19,20 and June 22 to pitch the project. A 3 days pitch workshop by expert Stephanie von Lukowicz, de Lukimedia. Acommodation and meals for 3 days, 1 person. Shuttle bus from hotel to market venue. Pitch session participation. One to one sessions. The IFIC Award will offer the consulting services the Institute considers to be the most suitable for the selected project: screenwriting, creative memory, executive production or help seeking funding. Delivery of a professional report analysing the strengths and weaknesses of the project and suggesting possible actions to help improve the work. This document also contains an artistic-creative report. Three consultancy sessions each lasting approximately 60-90 minutes. These meetings, which may be in person or online (depending on geographical location), will be held at intervals of 4-6 months, depending on the needs of the project. 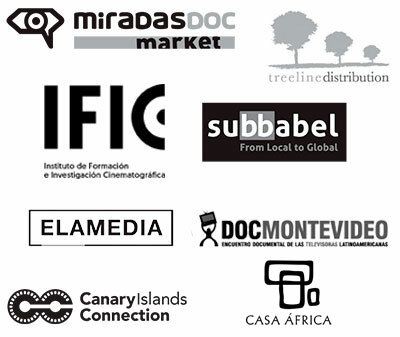 This is an initiative of Consorcio de Exportación Audiovisual de las Islas Canarias, S.L. to support new talents in documentary filmmaking and help them access the traditional distribution channels. The awarded project will have the opportunity to sign a one-year contract for international distribution in the main markets within the Canary Islands Connection catalogue, according to the general market conditions. The members of Consorcio de Exportación Audiovisual de las Islas Canarias, S.L. and/or the projects with an international distribution contract already in place are not eligible for the award. Canary Islands Connection is the international brand of Consorcio de Exportación Audiovisual de las Islas Canarias, S.L., a company born within the Canary Islands Audio-visual Cluster to promote the international sales of the Canary Islands audio-visual productions.